Forget-Me-Not Farm is green pastures for horses and green living for humans! 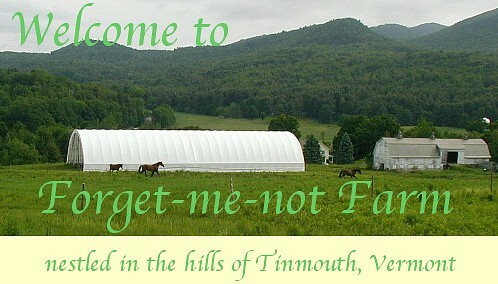 The farm is situated in the lovely Taconic mountains of Tinmouth, Vermont. We strive to make our horse and human activities on the farm as natural and environmentally friendly as possible. Forget-Me-Not Farm and was home to SolarFest, Vermont’s Renewable Energy Festival 2004-2014. Our lovely B&B and Farm is also Vermont’s premier eco-friendly wedding site.